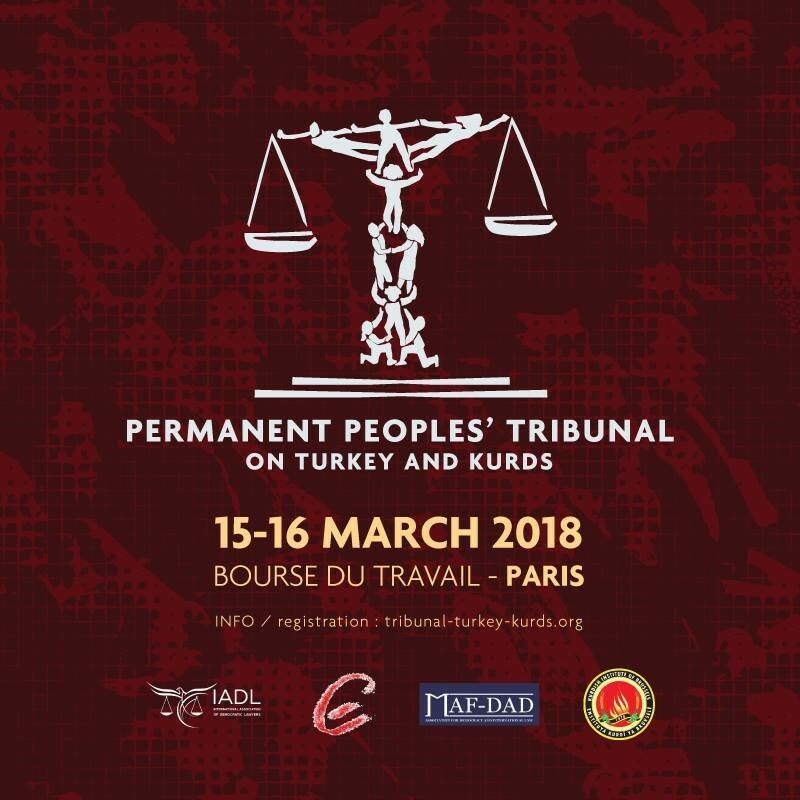 At the request of 4 organisations: the International Association of Democratic Lawyers (IADL), the European Association of Lawyers for Democracy and World Human Rights (ELDH), Mafdad, (an organization based in Germany of Kurdish and German Lawyers), and the Kurdish Institute of Brussels, the Permanent Peoples’ Tribunal will meet on 15 & 16 March to examine the crimes committed by the Turkish Republic against the Kurdish people, both on its own (and Kurdish) territory and abroad. The proposal was formally accepted by the Tribunal on the 14th December 2017 and the Tribunal itself will be held on 15th and 16th March 2018 in the French capital Paris, in the Bourse du Travail, Salle Eugène Henaff, 29 Boulevard du Temple. It is alleged that in the framework of the armed conflict that opposes the Turkish State to Kurdish insurgents, war crimes have been committed by the Turkish forces. These crimes allegedly targeted deliberately civilians with the purpose of terrorising the civilian population. These type of crimes have, according to many sources, increased dramatically in intensity in the period of 2015-2017 after the Turkish state ended the peace talks with the representatives of the Kurdish movement and with the Kurdish Workers Party (PKK) in particular. The first main part of the session will concentrate on the aforesaid period and examine the events that occurred in the main Kurdish cities such as Diyarbakir, Cizre, Sirnak during this period. Several sources have reported the use of aircrafts, tanks and artillery by the Turkish army in civilian neighbourhoods of these cities causing massive destruction and loss of lives. It has also been alleged that Turkish agents have been involved in targeted crimes against opponents, in particular representatives of the Kurdish movement, Kurdish media etc. Such acts have occurred both in Turkey and abroad. Since its establishment and up to the present, the Tribunal has held 42 sessions (list) on a variety of human rights violations, including crimes against peace and against humanity, cases of genocide “and…crimes—not yet established—attributable to economic and political activities promoting poverty, inequality, exclusion.” The most recent – The Session on State Crimes Allegedly Committed in Myanmar against the Rohingyas, Kachins and Other Groups – released its verdict in October 2017. The judges for this tribunal will be: Mr. Philippe Texier, Mr. Domenico Gallo, Mr. Norman Peach, Mr. Denis J. Halliday, Ms. Luciana Castellina, and Mr. Majid Benchikh. Since the termination of the peace process in Turkey between Ankara and the PKK and the subsequent military incursion into Northern Kurdistan (south-east Turkey) many people and international organisations have been calling, so far unsuccessfully, for the Turkish State to be held accountable for the atrocities committed in this region during its extended “curfews”, in particular in Cizre, Nusaybin, Sirnak and Diyarbakir in 2015-16, which witnessed the death of many civilians and the indiscriminate destruction of whole neighbourhoods. Despite their appalling isolation in times of need, the Kurds have friends among the international community. Former leader of Sinn Fein, Gerry Adams is one of the voices pledging support for the Tribunal. Global Rights editor and writer, Orsola Casagrande, will also attend the Tribunal and provide updates for each of the day’s hearings. The invitation sent to Turkish officials to attend has, so far, not been responded to. Maybe – as is set out in the indictment against them, prepared by the panel of international lawyers – they are currently too busy ‘neutralising’ children and old people in the Afrin Region of Northern Syria, to consider their defence?